Aussie hip-hop luminaries Adrian Eagle and Krown will celebrate the power of music to spark social change when they take to the stage for the NGV Teens Art Party on Saturday 16 February. Hosted by Triple J presenter Stacy Gougoulis, the event will also feature a live performance by teenagers from Voice for Change, a community-based mentoring initiative, as well as access to summer blockbuster exhibitions Escher X nendo | Between Two Worlds and Julian Opie. Adrian Eagle and Krown are both mentors for Voice for Change, a community-focused initiative that inspires young people to follow their dreams. Bringing together some of Australia's leading urban music, hip-hop and sporting personalities from a diverse range of backgrounds, the project promotes inclusion and acceptance, empowering youth to overcome adversity. Both artists have been working closely with Voice for Change to mentor a group of students who will share the limelight with their own Art Party performance, demonstrating how creative forms of expression can positively connect teens to each other and to their local communities. The NGV Teens Art Party will also provide excusive after-hours access to Escher X nendo | Between Two Worlds, the first exhibition in the world to feature the extraordinary work of Dutch graphic artist M. C. Escher in dialogue with the work of acclaimed Japanese design studio nendo, led by designer Oki Sato. Taking place on the closing weekend of Julian Opie, the first major Australian exhibition from the British artist, teens will also have the opportunity to create their own digital self-portrait as a digital takeaway. Applications are now open for the 2019 NGV Teen Council, the NGV's flagship teen advisory panel, and will close in early February. 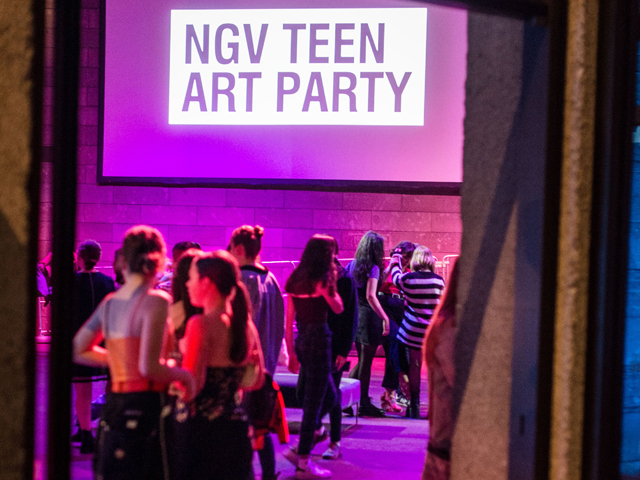 The bi-annual NGV Teens Art Parties are created with the contribution of the NGV Teen Council, an advisory group of teenagers who volunteer their time to represent their peers in developing activities and programs at the Gallery. From planning NGV Teens events to learning about the inner workings of NGV, this one-year commitment gives members the opportunity to have their voices heard. 'Being on the Teen Council has been such a privilege. I've gotten to meet so many new people, I've learnt so much about art and I've been exposed to so many amazing opportunities to do with the creative arts,' said 2018 NGV Teen Council member Benjamin, 16. The NGV Kids and Teens program is supported by The Truby & Florence Williams Charitable Trust, managed by Equity Trustees.